Capps Home Building Center is a full-service building supply company that has served not only retail customers but a large number of building professionals at Smith Mountain Lake and the surrounding area since 1978. Contractors in a wide array of specialties count on Capps’ large, drive-through lumber yard, helpful employees, extensive inventory and even larger selection of special-order items available through the Do it Best Corp. We’re always on the lookout for new products that will keep our customers ahead of the competition, saving time and money. 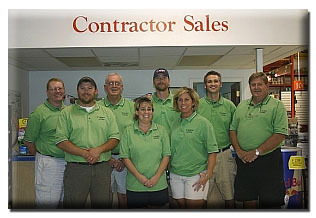 Our knowledgeable staff offers more than 80 years of sales and service in the building supply industry. They are truly experts on the products Capps sells. In addition, Capps offers free delivery, usually within 24 hours of placing the order, for in-stock items. At Capps, building professionals never have to guess on pricing. An on-staff estimator can provide quotes on house plans, including trusses, siding, shingles, drywall, windows, interior doors, engineered lumber and more. The Capps showroom features displays of Andersen windows, Plygem windows, Therma-Tru doors, Hardi-Plank, Certainteed and Smartlap sidings.